The challenge of making and keeping peace is a task far too great for any one faith community to tackle on its own, and the deeply impressive work of the Peace Mala network over the years has consistently reminded us of this. It has been a privilege to be involved with this vision, and I pray every blessing on all it continues to do. 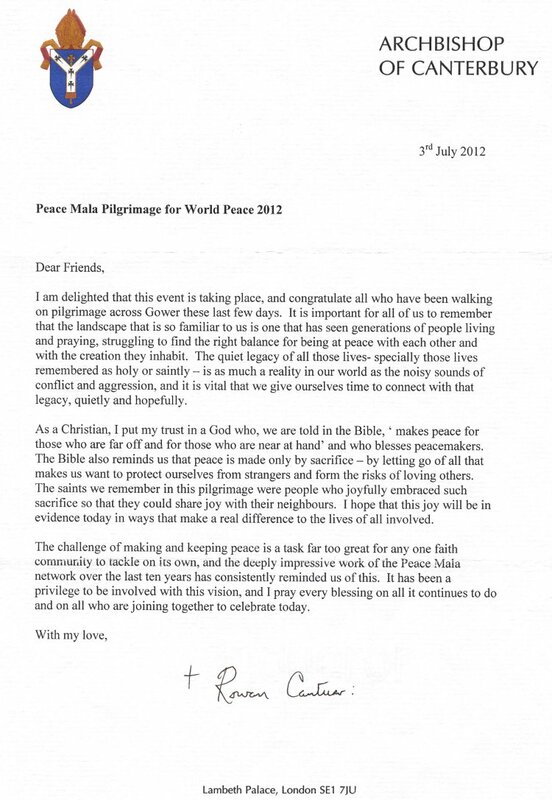 Dr Rowan Williams has been a keen supporter of Peace Mala ever since its launch. 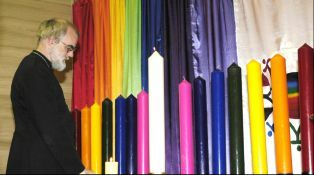 His link with the project began when he first visited Coedcae School in Llanelli during May 2001 after pupils wrote to him asking questions about his religious beliefs and his work as an archbishop. He spent a day with students and staff of the Department of Religious Studies and proved a tremendous hit. Students were particularly impressed with the archbishop's love of 'The Simpsons', his brilliant answers to their difficult theological questions and his warm and relaxed manner. He received a spontaneous standing ovation from pupils; something staff had never witnessed before. Dr Williams is undoubtedly a man of exceptional academic brilliance but more importantly a man of humility and compassion who has a lovely sense of humour. It is a joy to be in his company, and that's what pupils have responded to today. Strong and distinctive religious commitments need not involve hostility and bigotry. I welcome this contribution to friendship. He also promised that he would try his best to attend the launch. 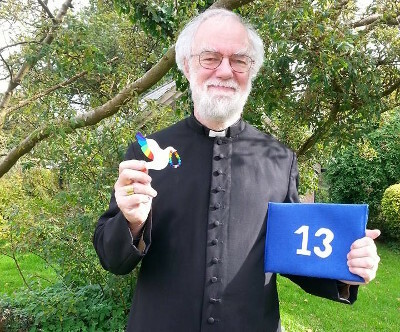 Later in the year it was announced that Dr Williams had been chosen to become the next Archbishop of Canterbury; the chance of him finding time to launch the Peace Mala now seemed very unlikely. In the summer of 2002, Pam was thrilled to receive a phone call informing her that Dr Williams would be able to launch the Peace Mala project and that he was looking forward enormously to it. The launch proved to be one of his last formal engagements as Archbishop of Wales. In April 2003 Dr Williams wrote to Pam after being asked if he'd be a patron of Peace Mala. He replied saying he'd often thought about her and the children in recent months. He also wanted pupils to know that he was able to deliver a Peace Mala personally to the Prince of Wales, who was very enthusiastic! I shall be glad to be a patron, indeed honoured. The link with that memorable afternoon is valuable to me, and I do want to stay in touch with the vision of all those children. Dr Williams keeps in regular contact with Peace Mala HQ in Swansea and is always enthusiastic to hear of our news and progress.